AMERICAN investment bank Lehman Brothers is planning an unusual initiative in Singapore, Financial Times reported recently. It is specifically targeting gay and lesbians who aspire to be bankers. This follows the success of a presentation and buffet dinner for 50 gay students in Hong Kong. Today has learnt that the banking giant is not alone. Global banks around Asia are breaking new ground to attract and retain the best and brightest. Increasingly, their hiring and diversity policies are taking into account the homosexual community, which makes up as a significant part of the talent pool. At UBS Singapore, for example, benefits including health insurance are extended to a staff's "significant other", defined as "a person who has cohabited with an employee for a continuous period of 12 months". The couple does not need to be married, and sexual orientation is not an issue. Money is a factor in the competition for talent, but keeping up with social changes is also important. "This is why our benefits policy is designed to be as flexible and inclusive as possible," said Ms Leona Tan, UBS Singapore's diversity advisor. Merrill Lynch, on its part, has four professional networks in the Asia-Pacific region for its staff, one of which is the Lesbian, Gay, Bisexual and Transgender network, set up last April. The other networks are for women, young professionals and parents. The firm even has an annual diversity week, when it hosts speakers, events and conferences for the various networks. "Our efforts in the area of diversity are about how we can create the most effective and inclusive environment, one in which we value diversity rather than simply tolerate it," said Mr Roman Matla, spokesperson for the bank's diversity and inclusion team. I suppose this article is useful for public education purposes in Singapore. On the other hand, I could not help finding it somewhat funny. The article suggests that by taking gay people into account in their HR policies, foreign banks are doing something really unusual and innovative – “breaking new ground”. Actually, this is nothing new at all. Practically all US and European banks have global HR policies recognizing the rights of their gay employees worldwide. Such policies would have been in existence for many years. For example, my current employer has a HR policy which promotes fair and equal treatment of all employees. Among other things, the policy says that no employee is to be discriminated against on the basis of his race, nationality, age, religion, gender, marital status, disability or sexual orientation. Deutsche Bank AG: “We think of Diversity in its broadest sense, embracing all of those differences that make up the exciting, challenging world in which we live. These include age, culture, ethnicity, gender, nationality, personality type, physical ability, religion, sexual orientation, and work style." Well, yes, the Dark Ages still prevail in Singapore. However, most other developed countries moved on long ago. They already discovered that gays are human beings too, you see. AN IMPROVED version of a programme that helps pupils who are weak in English has led to higher passing rates for them, the Ministry of Education (MOE) said yesterday. The scheme, known as the Learning Support Programme (LSP) for English, emphasises pronunciation and recognition. Under it, pupils who had barely understood two-letter words later learnt how to read long passages and passed their exams. Around 65 per cent of the 402 Primary 2 pupils in this pilot scheme eventually made the grade compared to only 40 per cent previously, the ministry said. The new scheme has made such a difference that it has been rolled out in all primary schools. Around 5,600 pupils who are less proficient in reading than their peers will come under this scheme. This comprises up to 14 per cent of each Primary 1 cohort. While the old lessons were remedial and no different from the usual English classes, the new ones focus on skills, said Ms Thoo Mei Lan, a senior reading specialist at MOE. Senior Parliamentary Secretary for Education Masagos Zulkifli gave reporters an update yesterday, saying that the ministry had looked into improving the LSP as its pass rate had been 'hovering at 40 per cent for a long time'. Many pupils start Primary 1 not being able to read words like 'on' or 'is', said Ms Thoo. Now, they are taught to recognise the letters of the alphabet and to decode and spell words. After going through the programme, they should be able to read even polysyllabic words such as 'sapphire', she added. This article makes me feel a little sad. It's not that difficult for parents to teach their little kids to read. My son knew all the letters of the alphabet even before he could talk. (If you wrote out all 26 letters of the alphabet, he would be able to correctly point out whatever letter you randomly asked him to point out). Before he could even hold a pen properly, he could already spell words like “cat”, “dog” or “house”. My daughter is three years old and can recognize probably around 200 different words with no conscious effort. She has a good grasp of phonics and that enables her to break down more complicated words (“COM-PLI-CA-TED”) and figure out how they sound, even if she doesn’t know the meaning. What’s the simplest way to teach a toddler his ABCs? Put him in front of a TV, and play a Sesame Street VCD. That’s it. As the child progresses, you substitute with more advanced VCDs. I highly recommend “Between the Lions”, for kids who have learned their ABCs and moving on to learn simple words. The storylines are so wickedly humorous and entertaining and the music so good that as an adult, I enjoy watching the show too. Many people think that TV is bad for kids, but that has not been my experience. In my opinion, it largely depends on what programmes you let them watch. These days, plenty of excellent children’s shows are available. You just have to choose intelligently. Of course, books are also of vital importance. The trick to teaching a little kid to read is to make it fun. There should be no coercion or pressure – it would kill the kid’s natural joy for learning. Buy a wide variety of children’s books and leave them in your kid’s room. Always let the kid choose what he wants to read. If the kid loses interest halfway and doesn’t want to read anymore, just stop right then. Where can you get lots of good children’s books, without burning a hole in your wallet? Look out for the book sales by Times or the National Library, at the Singapore Expo. At these events, books go at extra cheap prices. Buy in bulk. I go to these events with my suitcase, no kidding. If you don’t want to wait for these events, go to the Children’s Book Store on the 4th floor of Bras Basah Complex. This is a place where kindergartens and playschools regularly source for children’s books. You get brand new books here at very cheap prices – most books would be between $3 and $8. When you read to your child, be sensitive to the material. Different books can be used, and are designed to be used, in different ways. Don’t read like a tape recorder. Keep the process interactive. Give the kid time to point and poke at the pictures. Before you turn the page, ask the kid to guess what’s going to happen next. Read dramatically. Act out the story as you go along. Ask your child supply the sound effects (for example, if you are reading a story about the Dark, Dark Woods, ask him to howl like a lonely wolf). As your child’s reading skills improve, take turns with him to do the reading – get him to try reading the next word, or sentence or paragraph. Invite questions – talk about the animals, or the flowers, or different countries, or good manners, or whatever the book is about. Young kids often like to read the same book again and again. This is normal – they need the repetition to learn. Don’t be impatient or bored. Get innovative in the way you read. Entertain them, and yourself. Reading with your child is a good way to bond. It’s also like aerobic exercise. 20 minutes a day, three or four times a week, is enough for excellent results. While we're still on the topic of education, I'll share a few thoughts on a recent interesting experience of mine. Last week I took a day off from work, to give a talk at a secondary school. The other guest speaker was Stella Kon, one of Singapore's best-known playwrights. We spoke about creative writing, to an audience of about 60 literature students. By the way, I don't get paid for doing things like this. However, students in Singapore do study a few of my literary works from time to time (as these works are included in the Education Ministry's official resource book for literature teachers). So I am happy to offer my time, meet students and help to make Literature, as a subject, come alive for them. (And before anyone asks, no, my real name is not Catherine Lim). Anyway, a few of my observations from this experience. My session was just one of several events comprising a Literature camp for the students. Among other things, the students made field trips; took photos of various places discussed in local literature; wrote their own poems and short stories and acted them out; and came up with different ways to represent literary works (for example, through art or music). My first impression was that such activities could be too challenging for the average Secondary 3 student. On the other hand, it really depends on how the teachers conduct the activities. I felt that most of the students did enjoy my session a lot. "I am your homework, " I said, "and it's not often that you get to talk to your homework, and ask questions about itself." I was promptly peppered with a wide range of questions, including "Do you have a day job?" and "How has your religion influenced your writing?". All in all, I felt that the school deserved credit for organising a camp like this. Certainly, when I was a student and doing Literature myself, we never got to try our hand at such interesting activities. Meeting a real, live writer wasn't an option either, since we mostly studied the works of dead white men like William Shakespeare. I also had the opportunity to chat with a few of the teachers. I learned that Literature was not a popular choice for Secondary 3 students. Most students want to do the triple sciences (Physics, Chemistry and Biology) which leaves them room for only one Humanities subject. The preferred choice then becomes History or Geography, for the reason that Literature is perceived as being more difficult to score well in. Well, some things don't change, do they. As you may have heard, in recent years, many schools don't even offer Literature anymore, as it tends to drag down the overall pass & distinction scores. A final observation. I was curious as to why the school had invited me to speak at this event. Yes, I am an MOE-endorsed local writer, but in my opinion Singapore has several other writers who are more interesting and more active than myself, on the literary scene. "Like who, for instance?" the teacher asked. "Well, like Cyril Wong," I said. Cyril Wong, by the way, has published seven books and was the 2005 Young Artist of the Year for Literature; and the winner of the 2006 Singapore Literature Prize; and a former runner-up for the NAC-SPH Golden Point Award. 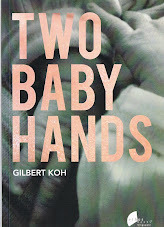 In my opinion, he is perhaps the most significant and talented writer, among Singaporean writers living today. "Ummm, Cyril. Well, we visited his blog," said the teacher, "and it had a picture of a naked man. We didn't think Cyril was very appropriate for our Literature students." Cyril is gay, you see. The gay theme emerges in some of his writings, sometimes subtly, sometimes overtly. As a matter of pure literary merit, he produces some of the best works in the history of Singapore, but this achievement cannot be fully acknowledged in our schools. We are still a homophobic society. Along the same lines, Alfian Saat is also a "dangerous" writer. He is hugely talented, and his works are very thought-provoking. But because Alfian's works are so sharply political, so sharply critical of the government, they will have no place, or only a very limited place, in the Singapore classroom. In effect, he is censored from the minds of young Singaporeans. Thanks to Lui Tuck Yew (again), Alfian isn't even allowed to do relief teaching in our schools. Sad, but true. In the end, the students will just have to settle for staid old Mr Wang. And even then, the Ministry of Education only picks my more-conservative works. In my earlier post, I wrote about the school principal who had strongly urged her Secondary 5 students to give up studying for their O-levels and go to the ITE instead. This incident reminded of Freakonomics, a very interesting book that I had read some time ago. Here's the relevant point from Freakonomics. As society grows more complex, more and more specialists evolve. Doctors, lawyers, financial advisers, property agents, journalists, religious leaders and car salesmen - all of them are specialists of a different kind. The individual cannot possibly be an expert in every field relevant to his life. So he must often rely on advice from different specialists. For example, if he is ill, he will consult a doctor. If he wants to buy a car or sell an apartment, he will talk to a car salesman or a property agent. The Freakonomics authors warn us that very often, the specialist's self-interest is not fully aligned with the self-interest of the person seeking information or advice. In other words, it often does not serve the specialist to tell you everything that you should know. For example, it may take too much time for the specialist to tell you everything you should know, and there is no reward for doing so - therefore he won't. Or the specialist might deliberately withhold certain information about his product / service, because if you knew all its flaws, limitations or disadvantages, you might not want his product / service any more. Or he may deliberately slant or angle his advice in certain ways, so that you will be inclined to make a decision that serves his own self-interest. And there is usually no equal footing, because the specialist, by virtue of being a specialist, already knows more than you. He holds the edge. Let's now consider our education system. Socially, we are conditioned to think of education as a noble thing, and of educators as noble people. Certainly this view has some validity - some people would say, a lot of validity. But at the same time, we must realise that there are different actors within the school system. Different actors means different self-interests, and that means the Freakonomics info/advice problem must arise again. What's good for the Ministry of Education is not necessarily good for the principal. What's good for the principal is not necessarily good for the teachers. What's good for the teachers is not necessarily good for the students. And what's good for the students may not necessarily be good for the teachers, principal or the Ministry of Education. (Minor digression - here is a brief account of how I, as a student, went against the government's then-prevailing career advice for young Singaporeans. I thereby became quite rich and successful). It is very good for the principal, if the school achieves a high overall pass score. An ambitious principal may well aim to achieve, say, a 98% or 100% pass score. It is conceivable that such an ambition may heavily shape a principal's advice to the students or the way the principal runs the school. For example, the principal may discourage students from exploring knowledge outside the formal school syllabus (such extra learning may be good for the students, but will not help the overall pass scores). Or the principal may prevent the students from taking subjects which the students are interested in, but which are considered harder to pass (for example, Further Maths, or Art, or Literature). Or the principal may seek ways to put extreme pressure on the students to work as hard as possible, such that a few of the less-resilient students will inevitably suffer severe stress. Or the principal may advise the weak students to leave the school and pursue other options elsewhere (if these students stay, and fail their exams, then the overall pass scores would be damaged). And the students may never realise that their education is being shaped, not by considerations of what is good for them, but of what is good for their principal. The Freakonomics authors do not say, of course, that in every case, specialists are out to hurt the advisee's position. In many situations, the interests of the advisor and the advisee could be well-aligned - this means that the advisor has a strong incentive to be genuinely helpful. What Freakonomics does warn us is that when we receive any specialist advice, we should pause to ask ourselves - what are all the possible reasons why the specialist is telling us what the specialist is telling us? "Passive acceptance of the teacher's wisdom is easy to most boys and girls. It involves no effort of independent thought, and seems rational because the teacher knows more than his pupils; it is moreover the way to win the favour of the teacher unless he is a very exceptional man. Yet the habit of passive acceptance is a disastrous one in later life. It causes man to seek and to accept a leader, and to accept as a leader whoever is established in that position." - Bertrand Russell. So beware of the specialists in your life, whoever they may be. A group of 27 girls in a Secondary 5 class in a mission school - which shall remain unnamed - were advised by their principal on the first day of school last week to seek transfers to the Institute of Technical Education (ITE), since they were unlikely to do well in the O levels this year. To back her point, she even flashed the girls' detailed N-level grades on the board in class using an overhead projector; she also stressed that she wanted 100 per cent passes in her school. ".... she also stressed that she wanted 100 per cent passes in her school." In other words, the principal is concerned that the weaker students will lower her school's overall pass score. She would prefer that they get out of her school as soon as possible. After all, the size of her annual bonus could be affected by the school's pass score. This kind of thinking happens in better schools as well. I was previously a student at one of Singapore's top junior colleges. I remember one group session where the Head of the Maths Department badgered the "weaker" students to stop taking Further Maths (one of the A-level subjects). Why? She didn't think that they had a good chance of scoring an A or B. They were at no real risk of actually failing, but they might conceivably score a C or D. Her fine record of top grades would be ruined! What a disaster. PARENTS and students may disagree with the tone a principal used when she told some Secondary 5 students to apply for the Institute of Technical Education (ITE) instead of doing the O levels, but the message was one that had to be delivered, said Minister of State for Education Lui Tuck Yew on Wednesday. Past data shows that 40 per cent of students will not do well enough to qualify for polytechnic, and students need to know this from the start, he said. Speaking to reporters after a teachers' investiture at the National Institute of Education, Rear-Admiral (NS) Lui said it was important to separate the 'tone' from the 'substance' of the message. 'Principals need to do their job to convey this message to the students and teachers to do their part to challenge them, set high goals and to help them achieve these goals,' he said. What's my take? 40% of Secondary 5 students don't make it to polytechnic. That means 60% of them do. If the odds are in your favour, why not try? What's the worst that could happen? One year later, you find that you can't make it to the poly. You can still go to the ITE then. Where's the damage? None that I can see. (And no, the size of your principal's annual bonus is not relevant). Yes, you would have "wasted" one extra year in secondary school, studying subjects like Maths, Science and English. But you would have a few GCE O-level passes and a N-level certificate, rather than just a N-level certificate. Surely that counts for something. And that extra year of education - is that really such a waste? Is studying Maths, Science and English in secondary school really so useless? I don't think so. But Lui seems to think so. I do wonder why he seems to have such a poor opinion of our education system. After all, he's responsible for it. Oops, did I just answer my own question. SYDNEY - AN ELDERLY pensioner lay dead in his apartment in Australia's largest city for a year before anyone noticed, officials and news reports said on Thursday. The body of Jorge Chambe, 64, was found on Tuesday in his single bedroom, government-owned flat in the Sydney suburb of Yagoona when police and firefighters broke in, after concerns about his welfare were finally raised. Decomposition of the body was advanced and bank records indicated Chambe died about a year earlier, officials said. The circumstances of Chambe's death triggered calls for a national strategy to better check on elderly people living alone, and worry that Australians were losing their sense of community. 'How can it happen that a person can die in such a lonely way and no one know?' New South Wales state Housing Minister Matt Brown told the Macquarie Radio network on Thursday. In news reports, neighbors at the apartment block described Chambe as a quiet man who was friendly but who kept mostly to himself. He had received federal government welfare payments and his rent was paid automatically by direct debit from his bank account. His mailbox had filled to overflowing, but no one had noticed a smell or other clues that he had died, the reports said. A worried neighbour finally called housing officials on Monday, and authorities broke in when Chambe did not respond. The above event may seem sad and shocking. However as the years go, we may safely expect such incidents to become increasingly common in developed countries with an aging population. Oh yes, that includes Singapore. This is the simple consequence of having smaller families, or not having children. The older you grow, the likelier it becomes that you have no relatives at all. You just outlive those who used to be around. This isn’t that difficult, because there weren’t many of them to begin with. In the 1960s, the average 30-something adult would have, say, one spouse, four children, six siblings, eighteen cousins and too many nephews, nieces and in-laws to easily count. In 2008, the average 30-something adult would have, say, one or no spouse; one, two or no children; and maybe one or two siblings, each likely to have one, two or no children. So nowadays, the probability of outliving all your relatives (or all relatives who care about you) is much higher. During the working years, loneliness is not an issue because working life itself provides a human community comprising bosses, peers, subordinates, clients etc. Senior citizens, while healthy, can also maintain a social network. They move around on their own, pursue their interests and meet other people (mahjong kaki; qigong group; community club etc). But over the years, the individual gradually grows older and weaker, and becomes less and less able to participate. He therefore slowly withdraws himself from society. Eventually, he becomes so disconnected from other human beings that he could die (as Jorge Chambe did), and for a whole year, no one would even notice. To me, Jorge’s story is sad not because he died and his death went unnoticed for a year. The sad part is really more how he must have lived, in the years before he died. As a follow-up to my previous post, I thought I would blog about heart rate monitors. I use one myself, when I go trotting around the neighbourhood. The model I use has three parts - a wrist watch, a chest strap and a little shoe pod. As you run, the chest strap device and the shoe pod will continuously capture information and transmit it to the watch. By looking at your watch, you can find out your heart rate, your average running speed and the distance you’ve covered. Depending on the model, you can also check how many calories you’ve burned, how much running you did in the aerobic/anaerobic range, and so on. 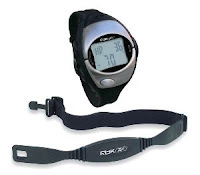 For me, what’s the most useful function of a heart rate monitor? Well, the watch automatically starts beeping when my heart rate rises or falls below certain thresholds. If my heart rate falls below the lower threshold, it means that I’m not pushing myself hard enough and therefore not really getting any cardiovascular benefits – I should run faster. But if my heart rate rises above the upper threshold, it means that I could be pushing myself too hard and should stop or slow down. Monitoring the upper threshold is important to me because I was born with certain heart defects. According to medical science, those heart defects are not a good reason for me to refrain from physical exercise. However, also according to medical science, those heart defects make me a better candidate for sudden cardiac arrest than a completely normal person. Since medical science can be such a contradictory pain in the neck, I take the middle ground, by exercising, but not too hard. And my heart rate monitor helps me to do that. (For those of you who are wondering, yes, there are ways to roughly calculate how fast or slow your heart should beat during exercise, depending on your fitness goals. Click here for more information about training heart ranges). Just in case I gave anyone the wrong impression, the heart rate monitor is not a medical device. In other words, it wasn’t invented to help heart patients exercise safely. It was invented to help serious athletes and fitness enthusiasts to train for optimal performance. Thus there is no scientific study (as far as I know) proving that the use of a heart rate monitor can help to reduce the risk of sudden cardiac arrest (whether in serious athletes, ordinary folks or heart patients). Nevertheless it seems logical to me that this should be the case. This post comes too late, of course, to help the Unfortunate Major. I REFER to the report, 'SAF officer dies after 1.2km run' (ST, Jan 3). There has been a spate of deaths recently with the victims collapsing while running. Most national servicemen have to complete a 2.4km run in order to fulfil their annual Individual Physical Proficiency Test (IPPT), so I think it is high time the Ministry of Defence looked into revamping this segment of IPPT. On average, in order to obtain a Gold standard in the IPPT, a national serviceman has to obtain a minimum of four points (out of a maximum of five points) for each of the four stationary fitness stations and then run 2.4km in about 10 minutes, plus or minus half a minute. Anyone who has ever achieved a sub-10 for a 2.4km run can attest to the power of endurance needed, and the pain and fatigue undergone. Of course, the excitement and sense of achievement are what push one through. However, it is unrealistic to expect the majority of national servicemen to reach that level of fitness. Many have unintentionally injured themselves trying to break the 10-minute barrier by overtaxing their bodies. Hence, it is not advisable to set such a short time limit for a 2.4km run. Fitness experts recommend that we engage in a cardiovascular exercise continuously for at least 20 minutes in order to maximise its benefits. Running a sub-10 does not seem to serve that purpose. My suggestion is to extend the distance of the run to 4km or 5km, with a time limit of 30 to 40 minutes, thereby focusing more on the endurance and general fitness than speed. This should put less strain on the heart and body, while giving the runners some time to warm up and ready their bodies for the run in a less gruelling manner. We cannot delude ourselves that these 'running deaths', which have led to the demise of healthy men in their 20s to 50s, are coincidences. Neither can we attribute the concerns expressed over these occurrences to 'sensationalised news' by the press. Instead of a sudden burst of energy to complete a run in a short time, a longer run may be all it takes to prevent a cardiac arrest. Rick Lim was referring to the recent death of Major Tan Yit Guan. It was probably the TODAY newspaper which reported this incident most thoroughly. TODAY tells us that Major Tan did not even manage to jog the full distance of 1.2 km. He ran only about 600 metres and then walked the rest of the distance back to the finish. This suggests that Major Tan was already unwell that day. Rick Lim says that it is unrealistic to expect the majority of servicemen to achieve the Gold standard time. However, I don't think that the majority of servicemen are expected, or expect themselves, to achieve the Gold standard time (barring servicemen in certain elite vocations like the Commandos or the Guards). Rick also says that the standard recommendation for cardiovascular exercise is to do it continuously for at least 20 minutes in order to maximise its benefits. Of course it is always possible to relook the way the IPPT is done. However, at the same time, I would say that the IPPT in the SAF isn't done for the sake of your cardiovascular fitness or personal health goals. It's done for the purpose of ensuring a certain level of fitness in the soldiers, for military purposes. Also, it's not clear to me that extending the IPPT distance and increasing the time limit would help reduce incidences of sudden cardiac arrest. The real point is how hard you are pushed to exert. Is it really any safer for your heart, to complete 4 or 5 km as fast as you can, than to complete 2.4 km as fast as you can? For that matter, are people less likely to die from a 100-metre sprint, than they are from a 42-km marathon? MANY young Singaporeans, gainfully employed in a booming economy, have expressed anxiety about building a large enough nest egg for a comfortable retirement. This is rather disturbing. The reasons are not hard to trace, though, if one steps back and observes the lifestyles of these so-called 'yuppies' who hold lucrative jobs that promise much. Today, Singaporeans' consumption habits more or less mirror those of Americans who have traditionally been consummate spenders. And like Americans, many Singaporeans discount the future in order to consume today. They are hooked on what sociologist Thorstein Veblen termed 'conspicuous consumption', which used to be the affliction of the rich. To be sure, they get a lot of help in this respect. Crowded malls for drop-dead shopping with foodcourts to give respite to continue shopping; colourful full-page ads that tell you how good you look in that suit, how macho it would be behind the wheel of that new BMW, or hey, wouldn't that DaVinci sofa look great in our living room? ...... Keeping up with the Joneses has given way to keener appetites: affordable luxury; living well with a vengeance; we have it, let's flaunt it; you can't take it with you; and the rest. All of which keeps the cash register ringing and, of course, an unhealthy growth in credit card debt. One can argue that consumption is normal desire made possible by a successful economy. But if you think about it, how much do you really need? ........ What one sees is an ethos of consumption that really did not exist a couple of generations ago, when the norms of the lower class and middle class dictated thrift and austerity, living within one's means, saving for the future and for one's children, and not being conspicuous, really, about anything. The picture looks different now and it's not pretty. Overindulging Singaporeans are in a predicament of their own making and they must, for the sake of their retirement, find a way out unaided - and the sooner the better. The term "conspicuous consumption" was first coined in a book entitled The Theory of the Leisure Class. It refers to the expenditure of money or other resources for the sake of displaying a higher status than others. A simple example would be the purchase of an expensive branded watch, when one could have purchased a cheaper alternative that works just as well. In a developed, highly consumerist society, we might say that a large proportion of individuals are getting stuck at Level 4. At this stage, they are driven by their need for social status and their desire for respect. In turn, their lifestyle develops into one of conspicuous consumption, whereby they constantly seek to acquire more material items so as to display their wealth to others. "an episode or spurt in which the powers of the person come together in a particularly and intensely enjoyable way, and in which he is more integrated and less split, more open for experience, more idiosyncratic, more perfectly expressive or spontaneous, or fully functioning, more creative, more humorous more ego-transcending, more independent of his lower needs, etc. He becomes in these episodes more truly himself, more perfectly actualising his potentialities, closer to the core of his being, more fully human. Not only are these his happiest and most thrilling moments, but they are also moments of greatest maturity, individuation, fulfilment - in a word, his healthiest moments." Maslow predicts that the large majority of human beings will never get past Level 4. In other words, few people are truly self-actualising. If your focus in life is still on conspicuous consumption, then you are not a self-actualiser and you are a lesser being than you could be - and you aren't even heading in the right direction. One day, you might still become more than your car, your condo, your clothes and your credit cards. But first you will have to climb past Level 4. Good luck.